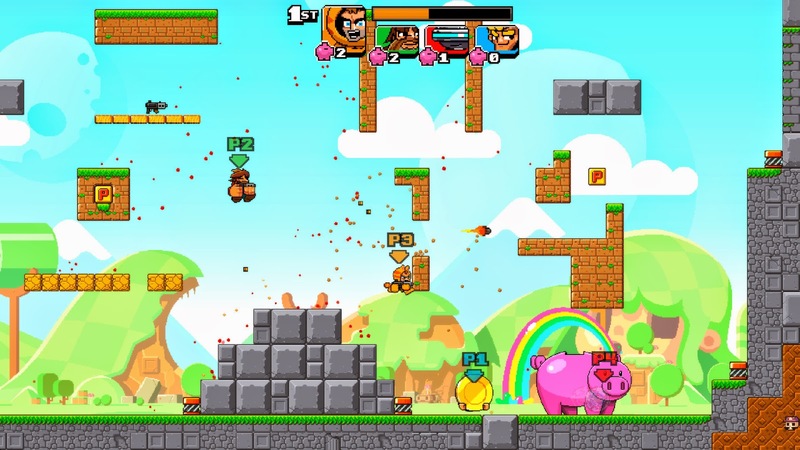 Mega Coin Squad, developed by Big Pixel Studios and published by Adult Swim Games, is the latest 2D platformer released under the ID@Xbox program. Does Mega Coin Squad’s flashy and frantic gameplay elevate it above similar games in its genre? Short answer: No. Long Answer: Nooo… You get the picture. Mega Coin Squad is a simple game. 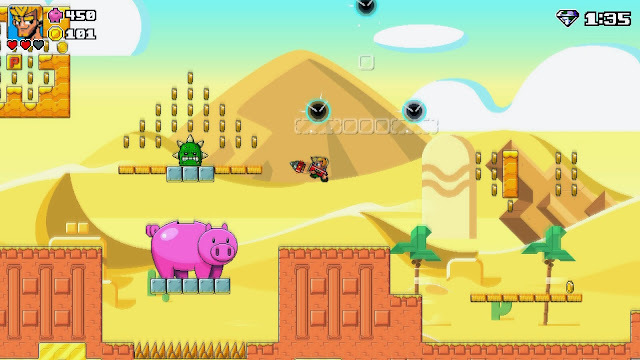 You collect the desired amount of coins and deposit them in a giant piggy bank and the level ends. Obviously, this isn’t as easy as it sounds because you will be fighting enemies, obstacles, and frame-rate drops along the way. When starting up the game, you have the option of choosing from 5 different characters each with distinct and varying abilities. For example, Chunk is slow but can burst through rock quite easily while Steph (best character IMO) is extremely fast and has a harder time plowing through that same rock. A sixth special character, Robot Unicorn, is unlocked when you clear the game for the first time. 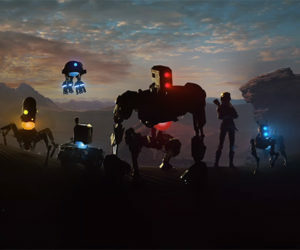 The game features four worlds, with four levels in each. The first three stages are like I described above. You collect coins and when you have enough, you deposit them in the piggy bank and move on. The last level in each world changes things up a bit: Instead of collecting coins you have to kill a desired number of enemies. To aid you in your quest, you are given three lives and a bunch of special abilities. Get hit once and you lose a life along with all the coins you had in your possession. Lose all the three and its game over. Luckily, you have infinite retries so you can always just start back right where you died. The coins you have to collect are placed just out of your normal jump height so you will have to use your forward dash, upward dash, and downward dash to reach those hard to get to spots. In addition to collecting coins, there are three challenges you can complete for each level: Not dying, banking all the coins in one go, and finishing the level in a certain time frame. For each one of these you complete, you earn a gem which you can spend in-between levels to upgrade your power-ups and special abilities. The further you get in Mega Coin Squad, the harder it gets. In the last world of the game, you will be required to collect 900 coins while the game just throws more and more enemies at you. It’s at this point the game almost becomes unplayable to a certain degree. The frame-rate will plummet and you will be teleported right into enemies over and over making you lose all your lives. It is not a fun experience. A playthrough of the game is quite short. My fastest time clearing the game is 27 minutes. 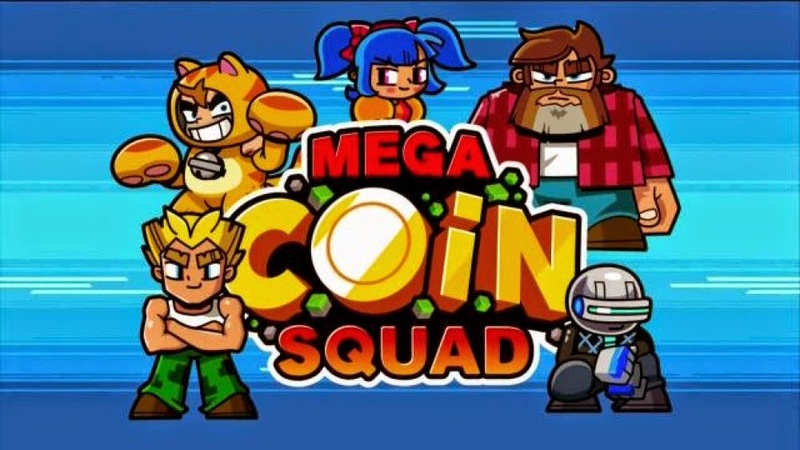 So if you are looking for a lengthy game, Mega Coin Squad is not a good choice. The game features a four player local only multiplayer mode, which I wasn’t able to try out, but might be cool if you have the friends or family to play with. Mega Coin Squad could have been a decent game if it wasn’t plagued with those technical problems. I liked the frantic gameplay and colorful art style but it’s hard to enjoy those things when you are getting headaches from all the frame-rate drops. What I played: 15 hours beating the game with all 6 characters and unlocking 22/22 of the games achievements.